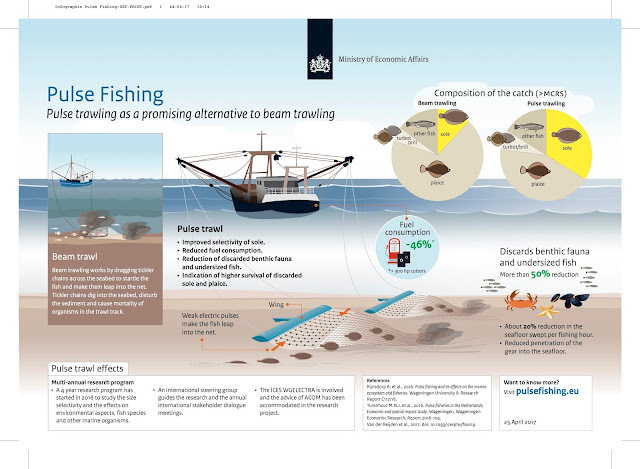 GeoGarage blog: Is fishing with electricity less destructive than digging up the seabed with beam trawlers? While many people may be interested in the sustainability and welfare of the fish they eat, or the health of the environment, fewer probably worry about the effect that trawl fishing – which accounts for 20% of landings – has on the ocean. For a long time researchers and the industry have been trying to improve trawl fishing practices. Things have moved on from practices such as beam trawling – where a large net is dragged across the ocean floor – to potentially less invasive and newer methods like electric pulse trawling. This sees electrical pulses being sent into the seawater to flush out bottom-dwelling fish like plaice and sole, causing them to swim into the path of trawl nets. Beam trawls have been the focus of environmental concern for decades, as it causes a substantial reduction in the abundance of animals living on the seabed. These effects can be long lasting if the fishing occurs in areas which are inhabited by long-lived seabed dwelling species such as oysters and sponges. Beam trawls are also associated with high amounts of bycatch – unwanted fish and other organisms – although the industry and researchers are working on ways to reduce this. However, the relatively newer electric pulse fishing is not necessarily a perfect solution either. Though it does not dig into the seabed to the same extent as traditional beam trawling, research has found it can fatally injure other species which may not be the target catch. So why use this method if it still has its faults? High fuel costs and EU legislation which has reduced the discarding fish at sea, have renewed interest in the use of electricity in fishing. Across the world, millions are fed by the fish caught by trawlers so it is unrealistic for trawling to just be stopped altogether, but the variety of negative impacts on the marine ecosystem remain a cause for concern. The UK government recently announced an review into the use of electric pulses by foreign trawlers in British waters due to concerns about its potential effects on the environment and bycatch. 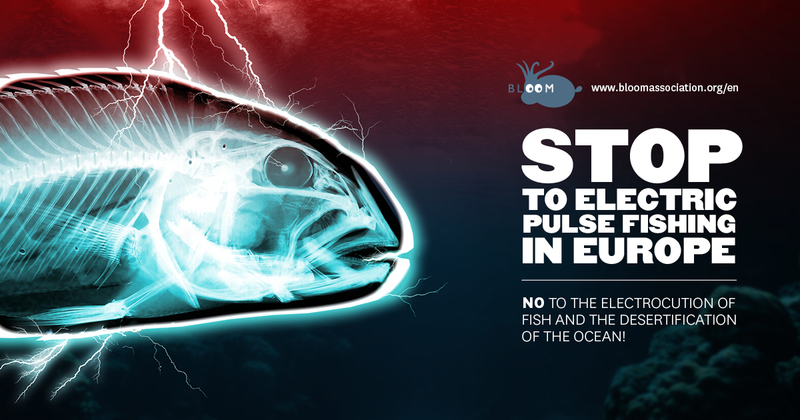 Campaign groups have also called on the EU to reinstate a ban on the electrical pulse method, calling it “destructive”. The current pulse trawls are fine-tuned to catch larger fish (the spine of the fish acts as a conductor), so that bigger fish respond more strongly to the electric stimulus and are more likely to be caught in the nets. This reduces catch of unwanted species that are less likely to respond to the electric pulse, and also reduces contact with the seabed. Traditional beam trawls, on the other hand, are fitted with heavy “tickler chains” – horizontal chains strung across the mouth of the trawl – designed to “dig” fish like Dover sole out of the seabed. Soles curl into a “c” shape in response to the electric stimulation used by pulse trawls, so they can be caught without the use of these “tickler chains”. Dispensing with the chains means that the gear is lighter, creates less disruption of the seabed, and substantially reduces the amount of other seabed organisms caught – by 75-80% per unit area of the seabed fished. By not catching the unwanted species, this improves the quality of landed catch too, because skin abrasion is reduced in the net. Together, improved catch quality and the reduced fuel consumption means greater profitability for the fishermen. Electric pulse seems like a good idea from this perspective, but studies of its effects on other species of fish – that are not the intended catch – show that larger cod in particular are prone to spinal fractures when in contact with the electric pulses. Small cod appear to be unaffected. Cod typically have a low survival rate if they are unintentionally caught in most trawls, so this issue of spinal fracture may be irrelevant if they are caught using either method. Additionally, though fewer seabed organisms end up in the trawl net when using electricity compared to traditional beam trawling, it is too early to tell whether the creatures remaining on the seabed are affected negatively by contact with the electric stimuli. Aquarium experiments, have shown that worms and shrimps, for example, recover within seconds following the application of an electric shock. However, these controlled laboratory experiments take place without natural predators – that may take advantage of a shocked creature – present. The issues here are not solely environmental. The pulse trawl fleet has encroached on grounds that historically were fished by fishermen using low impact netting methods, leading to some resentment and conflict with others in the fishing community. Societal acceptance of any food production method is vital, and at present – for pulse trawling – this is a greater challenge than answering the ecological questions. This issue could be resolved by more formal zoning of the sea so that pulse trawling is restricted to areas that do not impinge upon traditional low impact fisheries – initiatives which are currently in negotiation. Taking both society and environment into account, electric pulse trawling may not be an infallible solution, but it might a better way of trawling than the use of traditional forms of beam trawling.